I love learning about cultures. I'm not a fan or advocate of war, but a lot of what is depicted in The Art of War goes beyond that of common strategies for winning battle. Many of the philosophies by Sun Tzu can be overlapped into all aspects of human behavior singularly as well as groups of individuals. The basic premise of the points can be applied to business and all forms of relationships. To know one person, their habits, can teach you about their thoughts, their desires and their goals. From an observation standpoint, you can learn how to work with people, how to listen to people and how to properly lead people, as well as yourself. I recommend this book to everyone. 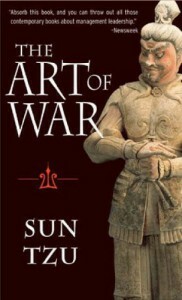 Be open to the concepts and look deeper at what Sun Tzu is describing to make it applicable to your life.